Why Should I Replace Lost Teeth? “Why should I replace missing teeth?” A simple question. What’s the big deal if you lose one or more teeth? Aside from the changes to your appearance, tooth loss can have a major health impact on your smile. Without replacement, everything from your facial structure to your smile’s alignment is in jeopardy. Fortunately, we can use dental implants to provide a lifelike replacement. Answer: A variety of factors can lead to a lost tooth, including injury or infection. However, one of the most common causes is advanced gum disease. Also known as periodontitis, this causes the connective tissues between the teeth and gums to deteriorate. 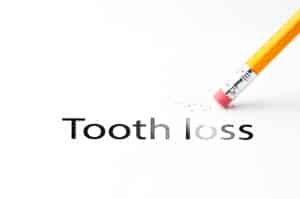 The teeth loosen and can eventually become lost. Question: How do I avoid losing future teeth? Answer: To prevent tooth loss you should try and maintain a healthy smile. Taking steps to reduce the risk of tooth decay and especially gum disease can limit the chances of losing a tooth. To do this, we recommend brushing and flossing daily, seeing a periodontist for an exam and possibly a cleaning, and be aware of any soreness, redness, or bleeding in your gums. Question: What happens if I don’t replace lost teeth? Answer: Without replacement, a single missing tooth can lead to misalignment as the remaining teeth drift towards the empty gap. However, more advanced tooth loss can lead to facial collapse and poor oral hygiene, as well as difficulty eating or speaking clearly. Answer: With dental implants we surgically insert a replacement tooth, one that can last a lifetime. The implant is restored with a dental crown, ensuring the tooth looks and functions like a natural one.